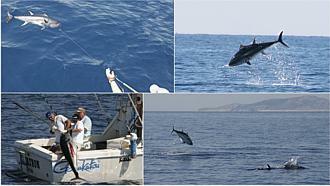 Sport fishing, Big-game fishing - Skippered Charter in Dalmatia, Mid Adriatic. To get the most out of your big game fishing in Croatia, it is a good idea to hire a boat with local guide (skipper) who can take you to the best fishing spots and who can reveal to you secrets of big game fishing. 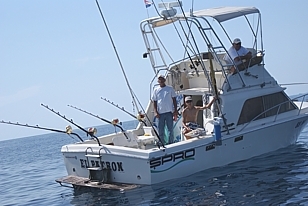 All our skippers are highly experienced professionals with many years of fishing experience in Croatian waters, and with a passion for the deep sea fishing. 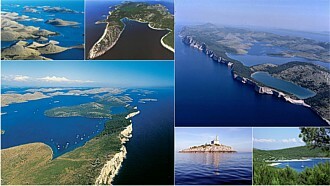 Most of them also participate in big game fishing tournaments, as succesfull competitors, and some of them are among Croatia's leading big game anglers. All our fishing boats are fully outfitted with world-class rods and reels (Penn International, Shimano...), sophisticated fish finding equipment and state of the art navigation electronics. We use the latest, top of the range fishing tackle and equipment for your maximum enjoyment and safety. Fishing tackle, consisting of rods & reels, bait, lures, etc. is included in the prices. There's no need to pay extra for a recreational fishing license either, we cover everyone on board under ours! The only thing not included in the price will be your food and drink. Although all the boats are fully outfitted with top-of-the-line equipment and carry all the fishing gear and tackle you need, you can also use your personal equipment if you like. We use the latest, top of the range fishing tackle and equipment for your maximum enjoyment. Our focus is on giving you great time on the water and the best fishing experience possible. To ensure this, we provide guided fishing trips (skippered big game charter) to some of the finest fishing grounds Croatia has to offer. 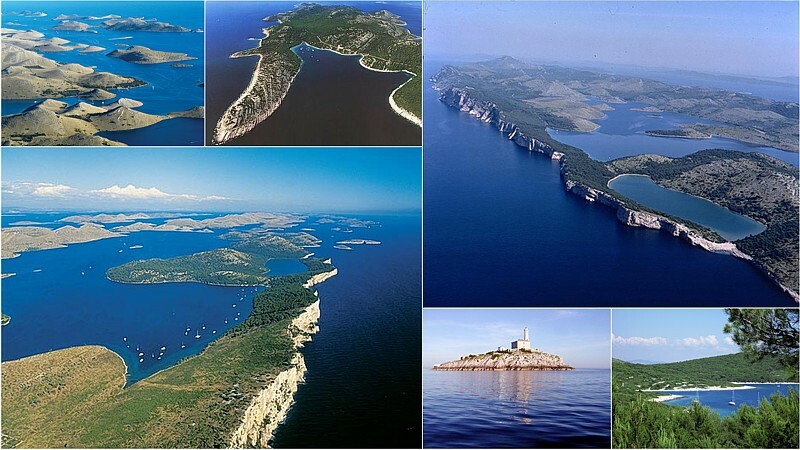 The waters around the island of Zirje and Kornati archipelago is not only the richest area for big game fishing in the Adriatic, but also the one closest to the shore. Traveling time to our fishing grounds is generally only about one hour and that means more fishing time for you. Our catches normally consist of Bluefin tuna, albacore tuna, swordfish, tresher shark, blue shark, amberjacks and dorados. To find more information about fishing area, with detailed maps, click here. The different techniques can be combined to maximize your chances of hooking the big one! Techniques include trolling artificial and natural baits, and chumming from a stationary or drifting boat. 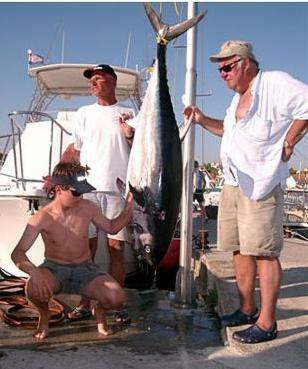 Trolling is a method of big game fishing where one or more fishing lines, baited with lures or bait fish, are drawn slowly through the water, behind the boat. Trolling is the most popular and effective way to find and hook most types of big game fish and it is most effective with live bait. The type of bait will depend largely on which type of fish you are hoping to hook. If live bait is unavailable, we will use a lure designed to resemble live bait. Chumming, or chunking, is the process of throwing pieces of bait fish overboard to attract larger game fish. Chumming works best with highly predatory big game fish like sharks, but will produce results for most species of big game fish. We will use different techniques to maximize your chances of hooking the big one! Techniques include trolling and chumming from a stationary or drifting boat.